AzBox ME with the AzTrino operating system pre-installed. Earn 325 SATVantage Rewards points with this purchase! Imagine the full potential of a set top box built with the last Technology, all in a DVB-API compatible device. Enjoy with Me, feel Me, love Me... It’s the beginning of a new generation, it’s the Me generation. The Blind Scan function lets you scan all channels introducing the chosen frequency range (whether they are or not saved in the memory receiver) and, of course, you can choose the satellite and the transponder too. It is a powerful function with control over the search parameters. AZBox Me is also a Media Player with full functionality for media of our modern days. Music, photos and video are easily played and accessed with our models. Allowing you to play your favourite songs, watch your holiday photos and movies. You can also play many advanced and high quality formats of audio and video. 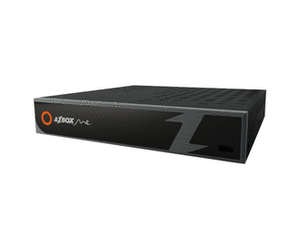 AZBox HD is capable of reproducing the High Definition format 1080p. With this format you can enjoy the highest quality content in the comfort of your home. Watching TV will become a totally new experience with crystal clear image, as if it were happening in front of you. Electronic Program Guide on AZBox Me allows you to schedule the recording of programs for later viewing, or schedule a watching list that will change the channel automatically to your favourite programs. A new way to never lose your favourite show. TV will never be the same. AZBox Me is equipped with a card reader (Conax license). AZBox Me has a File Browser totally compatible with your local or remote files, so you are able to copy, cut and paste them. You are able to browse files, not only in the local drive but also in the external drives connected, by using its USB hosting feature. Additionally, you can experience high level of convenience with the possibility of using wire/wireless networks, for the connection with your PC. AZBox Me models are capable of reading RSS feeds. This option is fully customisable by end user in various ways, enabling you to add any kind of RSS feeds provided by web sites as on-line news, blogs, among others. Channel related information and system operations are displayed via the VFD on the front part of the receiver. On AZBox Me you will not lose any critical scene of your favourite show, in casef you need to leave the room. Just activate the Time Shift function, the reproduction is paused and later you can resume it from that exact moment onwards. You can also choose to record the show for later viewing, which can be done by pressing a button, or by scheduling the recording. With Me, you have time on your hands.